It has been an incredible time in Ecuador which makes this an even more difficult time saying good-bye to everyone at the hospital, friends I have made, and the country itself. The privilege I have had to learn, work, and observe the healthcare system is truly humbling and I feel so grateful to return back to the United States safe and healthy. I walked int o my internship at Hospital Pablo Arturo Suarez pretty unsure of what to expect. Luckily, I realized I had a great amount of freedom and many opportunities to converse with healthcare professionals and patients everyday while performing my expected duties. A pretty big goal this summer was to learn Spanish medical terminology because I personally find it critical to be able to communicate effectively in another language as a doctor in our healthcare system. I found that over the course of the summer my knowledge expanded exponentially as I could keep conversations which conveyed medical information with patients. Another goal which I accomplished which was inspired by the class called American Healthcare at Brandeis was to observe and compare and contrast the different health care systems. Keeping this goal in mind really helped me shape the conversations I had with my mentors and doctors at the hospital. I also learned a lot about how culture differences can really impact medical differences such as in the difference in privacy practices in Ecuador (which is very loose) compared to those of America (more strict). Although there were many differences that raised a red flag, the healthcare system was incredibly effective and is catching up to the west every day. As well, the cost of medical care is incomparably cheaper. If you go to this link, you can read how much cheaper it is to get basic procedures done which changes the quality of living you can have. This experience has certainly helped me reaffirm by desire to pursue medicine as a career. Even more than reaffirm this passion, it has made me realize the privilege I have had growing up in the States and the great healthcare I’ve been able to receive. I realize more each day how important it is to give to those who don’t have access to healthcare the agency because of the tremendous impacts it can have on a persons quality of life. I know in the future I want to purse nonprofit/ volunteer opportunities here in America or other places in the world where this is a severe problem. By doing this, I know I want to expand my knowledge in public health and really focus on preventative/ holistic measures as mean of solution. Mitad del Mundo–or the equator! 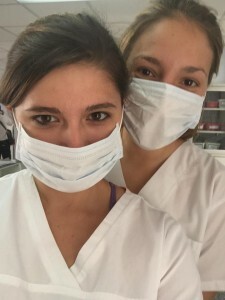 I would recommend anyone with an open mind, a passion for the medical field, and an ability to be flexible to volunteer at this hospital in Ecuador. Many times in order to get a fulfilled day it was up to me to take initiative and engage. A lot of succeeding and feeling accomplished each day came from a personal motivation to make the most of it. A personal goal/ reason for coming to Ecuador was to explore my own heritage and culture. I am half hispanic and immersing myself in Spanish and Latin culture was really wonderful for me to self-identify with. The ability to challenge myself with spending a summer in an unknown country and handle different mishaps along the way is by far what I am most proud of. 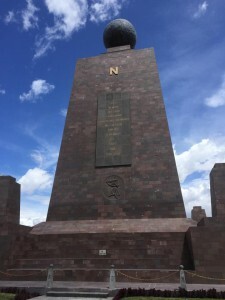 As a whole, I would recommend anyone to travel and explore the country Ecuador–and even according to NBC News, it is possibly the best place to retire! The views and opinions expressed in student posts are solely those of the contributors and are not necessarily representative of the Hiatt Career Center or Brandeis University.